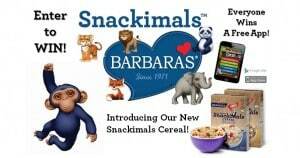 Click here to visit the Barbara’s site and fill out the form to enter their sweepstakes. There will be a total of 500 winners. Prizes range from free tote bags to stuffed beanies. You’ll have until November 30th to enter. Good luck!